(formerly known as Newport Center Villas; aka the Fashion Island car wash project). Note: At least for the moment, this project is history: the application for it was WITHDRAWN moments before its planned hearing by the City Council on September 27. One of the major financial investors is now suing the developers for fraud. Project Overview: The 150 Newport Center Planned Community Development Plan (PCDP) as originally proposed was to be composed of 49 condominium homes totaling 163,260 square feet, in a seven-story, 75.5 foot high building. The unit mix was to include ten residential townhomes, 35 residential flats on Levels 3 through 6 and four penthouses on Level 7. It was later reduced to a proposal for 35 units in 5 stories, and rather than regarding 150 Newport Center as a “planned community” of its own, it would be incorporated into the existing North Newport Center Planned Community District and be subject to its rules (although new rules would be invented for this parcel). 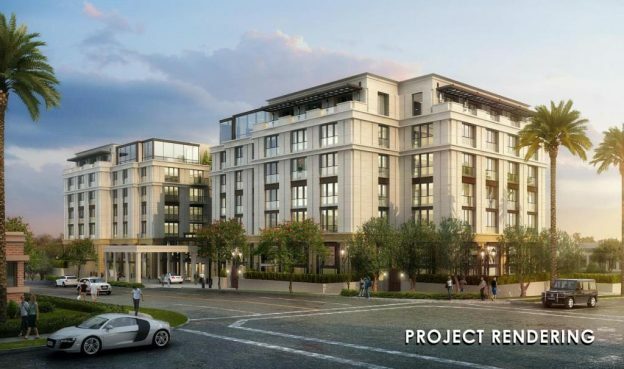 Why We Were Watching: This project would have replace the one-story 8,500 square foot Beacon Bay Car Wash directly across from Muldoon’s in Fashion Island. The structure height significantly deviates from the standard established for that area of Fashion Island. And, the project introduces residents into a primarily commercial/retail neighborhood, which includes late-night operations which generate business-related noise and congestion. On July 21, 2016, a slightly scaled down project began a three part hearing process before the Planning Commission, which was tasked with making a recommendation to the City Council. The applicants offered a scaled down proposal for 45 units in a six-story, 65.5 foot tall building with fewer shared amenities. City staff recommended the same number of units in a five-story, 55 foot tall building (in all cases, an extra 4 to 8 feet is allowed for rooftop appurtenances, such as elevator towers). At that first formal hearing, the Commission expressed so much concern about the required planning amendments (view SPON’s July 21 Planning Commission video here) that the expected second hearing on August 4 was rescheduled to August 18 to give staff time to consider changes. On August 18, the matter was heard starting rather late in the evening and the discussion was halted by a mandatory 11:30 pm adjournment time. The Commission primarily decided to ask staff to bring back a proposal in which, rather than creating a new “planned community” of its own, the 150 Newport Center parcel will be added to, and be governed by the same development standards as the existing planned community governing The Irvine Company’s commercial buildings in the interior of Block 100. On September 26, the 150 Newport Center applicants asked for a continuance of the Council hearing — purportedly so they could have more time to privately discuss their project with the Council members. But on September 27, barely an hour before the hearing on the Planning Commission’s recommendation of denial was to start, it was announced they had withdrawn their application entirely. According to City planning staff, this means they would have to start completely over again, with an entirely new application. SPON and its supporters were very well represented, both with written comments and with speakers at the Planning Commission hearings. We need to keep up this momentum to stop other proposed projects with a similar potential to negatively impact the character of Our Town! Our petition against the 150 Newport Center project closed with over 1,600 signatures gathered! Daily Pilot (September 2): Planning Commission recommends denial . . .
Daily Pilot (August 19): Planning Commission eyes height reduction . . .
Newport Beach Independent (July 29): Planning Commission Postpones Decision . . . This entry was posted in News, Opinion, Watch List on September 7, 2016 by SPON-Karen.